Music Volume EQ (Android) - Boost your sound quality on Android ~ Android Forever! "Enhance your music listening experience. Make it your Android sounds like never before. Music Volume EQ is a volume slider with live music stereo led VU meter and five band Equalizer with Bass Boost and Virtualizer effects. Improve sound quality on your Android device and get live readings of your current music volume level. Use with headphones for best results." 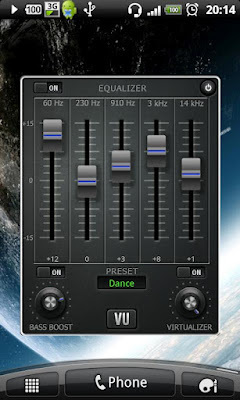 Music Volume EQ is FREE on the Android Market!